One of the main factors that make the Arctic unique is the seasonally varying length of day and night. The number of days during the summer when the midnight sun is visible increases with latitude, as does the length of the sunless period in winter. Seasonal changes in day length cause seasonal variations in solar energy, which is generally low and much of the received radiation is reflected by ice and snow. The radiation budget is negative for most of the year, except between June and September, and the climate is cold. A stable snow cover is established by the middle of September and lasts until the end of May in Eastern Siberia and to the end of June in Severnaya Zemlya and Franz Josef Land (Dolgin, 1959). During July and August precipitation generally falls as rain and is low (Figures 3.9 and 3.10). However, both air and soil temperatures are also low (Figures 3.5 and 3.8), resulting in low evaporation rates and excess of moisture in soil and on the surface. This excess of moisture allows evaporation to proceed at potential rate. About 70 per cent of heat is spent on evaporation and little energy is available for heating. Equally important are the phenomena associated with freezing and thawing as thawing and subsequent warming of soils in the Arctic are significant sinks of energy. Arctic climate is discussed by Barry (1983, 1989) and Barry and Hare (1974). The Arctic is considered to be particularly sensitive to climate change because of the several positive feedbacks such as ice and snow melt leading to decrease in surface albedo and magnifying change of cloud dynamics. Although long-term proxy climatic records are available for some locations in the Russian Arctic (see below), instrumental observations are limited in comparison with the middle latitudes and records date back only to the 1880s. These records show that significant warming occurred between the 1890s and the 1940s. During the 1930s, the warming was about 1.8°C for annual temperatures, which is three times higher than the mean Northern Hemispheric values, with winter temperatures being about 2.5°C and summer temperatures being about 1.3 °C above the long-term mean (Kelly et al., 1982). By contrast, the latest (post-1975) climatic warming has been modest in the Arctic in comparison with other regions although the pentade of 1990-95 was the warmest on record in the western part of the Eurasian Arctic (Przybylak, 2000). Temperature fluctuations have been largely attributed to changes in the atmospheric circulation, which are manifest in the North Atlantic region, while evidence for the warming due to the enhanced greenhouse effect remains controversial. Przybylak (2000) provides a useful review of the most recent climatic fluctuations in the Arctic. Russian scientists have been traditionally interested in the Arctic sea ice not least because of the longstanding ambition to establish all-year navigation in the Arctic Ocean along the so-called Northern Sea Route. Up to 90 per cent of the Arctic basin is covered by ice for most of the year; only 20 per cent of the Arctic Ocean and 50 per cent of the marginal seas are free of ice when the annual ice minimum is reached in the middle of September (Kupetsky, 1961). The main characteristics of sea ice are its constant drift and deformation. The main driving forces that move ice are wind and currents. However, ice is not a passive tracer and ice convergence, divergence, collisions between individual floes, and frictional drag on the bottom of the ice sheet moving over still water have strong effects on its circulation. Fluctuations in ice drift are controlled mainly by wind because variations in the atmospheric circulation are greater on a shorter time scale. The main pattern in ice circulation in the Arctic is the Transpolar Drift (TPD) from the Laptev and East Siberian Seas to the eastern coast of Greenland (Figure 8.3). About 900 thousand km2 of ice drifts annually across the Arctic Ocean (Kupetsky, 1961). Ice station data indicate a drift rate of about 3 km per day, although large variations have been observed from 20 km per day to nil (Gordienko and Laktionov, 1969). Sea ice decouples the atmosphere and the ocean and alters heat, matter and momentum transfer between the two media, affecting atmospheric and oceanic circulations and marine ecology. Heat flux through ice weaknesses prevents the occurrence of extremely low air temperatures typical of the continents. In winter, mean daily air temperatures over the Arctic Ocean are seldom lower than -35°C which is milder than those observed over the mainland (Prik, 1959). Seasonal freezing and melting play an important role in shaping the physical and chemical processes of the Arctic Ocean. In the process of freezing salts are drained out of the ice and transported to the deep waters. Therefore, the formation of sea ice controls salinity of the water, and consequently, its density, which in turn controls convection in the water column. The Arctic sea ice may be divided into three categories: polar cap ice, pack ice, and fast ice (the ice which forms between the shore and the pack). Fast ice forms first near coasts (it is 'fast' or anchored to the coast) where salinity is reduced by river runoff and freezing temperature is higher. The formation of fast ice begins in October while melting begins in June. The thickness of fast ice varies. It drifts away from the shore to be replaced by young ice and cracks, weaknesses and polynyas (areas of open water) form in the young ice. Refreezing of young ice is rapid unless there are conditions for its continuous divergence, such as offshore winds. Thin ice and polynyas permit large heat transfers: a half of the regional annual turbulent heat transfer is through thin ice which occupies about 6 per cent of the Arctic Ocean in winter (Maykut, 1978, 1982). 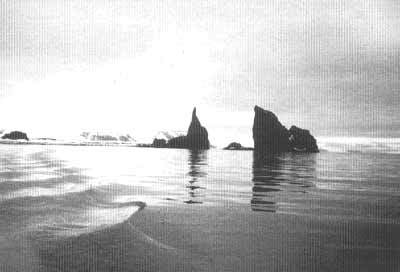 In the Laptev Sea, heat flux through weaknesses and leads in summer months exceeds the estimated heat input by river runoff by a factor of 2.5 (Zakharov, 1966). Due to the enhanced heat exchange, temperatures over polynyas are higher than over the ice-covered sea. Therefore, polynyas and areas of weak ice play a very important role in the formation of the Arctic energy budget which is further discussed by Barry (1983). Due to the lack of light and oxygen, the Arctic marine environment is extremely unfavourable for life. Polynyas allow penetration of light and oxygen into the water. Water salinity is higher in polynyas than under fast ice which promotes convection. Convection supplies oxygen to deep layers and brings nutrients to the surface. This ventilation of the ocean improves habitats and intensifies the development of the entire food chain from plankton to large vertebrates such as walruses. Pack ice and polar cap ice are characterized by greater thickness (on average 3.5 m for polar cap ice). Tidal rafting creates hummocks which can reach a few metres in height, distorting the otherwise flat landscape. 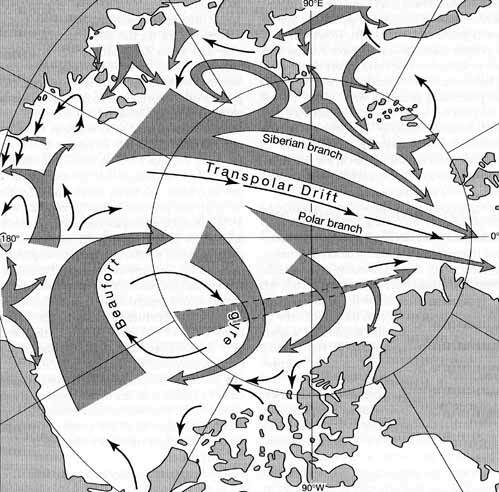 Climatic characteristics of the Arctic Seas are given in Gorshkov (1980), while a detailed discussion of sea ice conditions is given in Barnett (1991). The Barents Sea has the mildest climate of all Eurasian Arctic seas and is the only Eurasian Arctic sea that remains partially covered by ice during winter, about 70 per cent of the sea being normally ice-covered. Thickness of the first year ice is only 50-150 cm. Sea ice distribution is controlled primarily by the influx of warm Atlantic water brought by the North Cape current, an extension of the Gulf Stream, which prevents the formation of ice in the southern sector of the sea in normal winters except for the isolated fjords along the Murman coast. Old ice and thicker first-year ice are driven by north-easterlies from the Arctic Ocean into the northern sector between Spitzbergen and Franz Josef Land. The south-westerly flowing Bear Island current transports this ice further south and in early summer old ice can occasionally be observed as far south as Bear island (Vinje, 1985). The Kara Sea is characterized by much harsher climatic conditions than the Barents. While in the Barents mean January temperatures are about -10°C, in the Kara Sea these decrease from -15°C in the south-west to -30°C in the north-east. Novaya Zemlya effectively blocks relatively warm north-flowing Norwegian current, separating the Kara from the much warmer waters of the west. The average length of an ice season to the east of the islands is 245-293 days, while to the west it is normally under 160 days (Parkinson, 1992). Between November and June outside the young ice areas, ice thickness in the Kara ranges between 120 cm in the south-west and 2 m in the north-east. Distinctly different ice conditions form in the western and eastern sectors in summer due to different air temperatures, which vary between 5°C in the south-west and -2°C in the north-east, and river runoff (Dobrovolskiy and Zalogin, 1981). The Yenisey and the Ob bring warmer water into the western Kara and accelerate ice melt. At present, when the annual ice minimum is reached in mid-September, the waters south of 75°N are normally free of ice. Similar conditions were observed during the medieval climatic optimum. By contrast, the 16th century navigators searching for a northern route to the east were not able to advance further than Karskie Vorota Strait because the ice failed to melt. In the eastern sector, due to lower temperatures and runoff, nearly half the total area retains some ice through normal summers. Particularly heavy ice conditions occur in the Vilkitsky Strait, which separates Severnaya Zemlya and the Taymyr peninsula and leads to the Laptev Sea. The westerlies compact ice into the Vilkitsky Strait further exacerbating complex navigation conditions. Low winter temperatures, offshore winds, high river runoff and the extremely wide continental shelf control formation and distribution of ice in the Laptev Sea. The eastern Laptev and the western sector of the East Siberian Sea experience the largest formation of fast ice in the Northern Hemisphere; the mean annual ice export from the Laptev is 720 km3 (Zakharov, 1966). This area is the single largest producer of ice in the Arctic Ocean. In winter the ice regime is that of dilation: southerly winds push ice northward from the fast ice boundary, forming a nearly permanent area of weakness which reaches 100 km in width (Barnett, 1991; Reimnitz et al., 1994). During winter and spring, the total area of ice weakness (young ice less than 70 cm) and polynyas occupies on average 24 per cent of the sea (Zakharov, 1966). The constant ice divergence encourages further formation of ice and about 22 per cent of total ice is formed due to continuous ice export. In summer, the removal of old ice, heat gain by dark polynya areas and relatively warm river runoff accelerate ice melt, and most of the Laptev becomes ice-free as far as 77°N by mid-September (Barnett, 1991). Therefore, in winter first-year ice dominates most regions with an exception of the western Laptev where the East Taymyr current brings thick ice to the Khatanga's mouth and forms the Taymyr ice massif. This often persists through summer and can be compacted into the Vilkitsky Strait by the easterlies making it about the least suitable place for navigation. Two other characteristics of sea ice in the Laptev are important: first, the ice surface is smooth due to little compressional disturbance; second, fast ice is not attached to the shelf by deep ice keels (Reimnitz et al, 1994). These characteristics and the existence of year-round open water affect marine biology. The Laptev is a favourable habitat for walrus whose presence in the Laptev has been recorded 700 km further north than in the North American Arctic. These mammals require a benthic food supply and less frequent and severe bottom disturbance by ice keels as well as convection driven by ice production in polynyas favour colonization by benthic communities (Zakharov, 1966; Gorlikov et al., 1982). In contrast to the Laptev, the East Siberian Sea experiences the least summer melt. 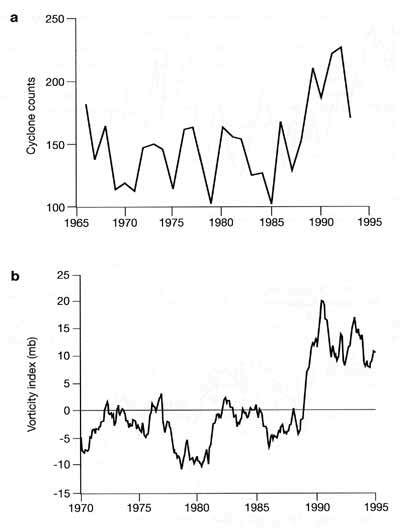 Low annual temperatures and meagre runoff, which is only 20 per cent and 35 per cent of that in the Kara and the Laptev respectively (Dobrovolskiy and Zalogin, 1981), result in over 50 per cent of the sea remaining at least under partial ice cover in summer (Barnett, 1991). The prevailing onshore northerly winds favour input of ice from the Arctic Ocean. The Ayon massif of old ice resistant to summer melt, which extends from the Arctic Ocean at about 165-170°E, often penetrates the coastal shipping zone. Characteristic of ice conditions in the Chukchi Sea is its large seasonal variations. Winter conditions are among the most extreme along the Arctic coast, while in summer 80 per cent of the sea becomes free of ice (Barnett, 1991). Although winter air temperatures are comparatively mild, reaching -20°C in the east, the shelf of the Chukchi Sea is not as wide as that of the Laptev and only a narrow, 10-15 km wide strip of fast ice forms along the mainland coast and Wrangel island. The only substantial area of ice weakness is a polynya on the lee side of Wrangel island which may be 50-100 km wide. Northerly ocean currents (Figure 8.3) and persistent compacting of old ice from the Arctic Ocean and the East Siberian Sea through the Long's Strait against the coast create a regime of compression, shearing, and extensive ridging. In summer, relatively high air temperatures and a seasonal warm current flowing northward through the Bering Strait result in substantial melt. The warm Bering Sea waters delay seasonal freezing until mid-November. The extent of sea ice is assumed to be an indicator of climate severity and global circulation model (GCM) simulations suggest amplified warming in the Arctic regions, substantial retreat of sea ice and reduction in ice thickness (Houghton et al., 1990; Fitzharris, 1995; Cattle and Crossley, 1995). The largest temperature changes are projected in the areas of marginal ice in the shelf seas, including the Siberian Seas. As yet, confidence in the ability of GCMs to simulate climate change in the Arctic has been low due to complex feedbacks and uncertainties associated with representation of the ice processes and runoff into the Arctic Ocean. Limited duration and inconsistency of reliable observational datasets from the Arctic make validation of the models and interpretation of results difficult. Although the first regular observations of ice regime began in the 1920s, detailed records of global sea ice extent became available only in 1978. So far, confirmation of the projected response of ice cover to global warming has been limited and there is no general agreement on the nature of changes in sea ice regime. Sea ice conditions in the Arctic have long been known to vary substantially from year to year but there is no simple relationship between the severity of winter climate and the extent of sea ice, and anomalies occur predominantly on a regional scale. An antiphase behaviour between regional ice anomalies in the Barents-Kara and East Siberian-Chukchi Seas has been long recognized (Itin, 1936; Zakharov, 1976; Barry, 1983). Coherent and asymmetric patterns of fluctuations in ice cover and length of sea ice season between eastern and western hemispheres have been found by Parkinson and Cavalieri (1989) and Parkinson (1992) wherby a shift towards a milder sea ice climatology in Eurasia has been accompanied by greater severity in the North American Arctic. Regional variations, which last from several months to several years, are controlled by air temperature anomalies and changes in atmospheric circulation (Power and Mysak, 1992; Chapman and Walsh, 1993; Maslanik et al., 1996; Walsh et al., 1996). Variations in the extent of sea ice are shown in Figure 8.4. Fig. 8.4 (a) Sea ice extent in the Arctic ocean in late August. After Zakharov (1981). There is a negative correlation between the ice extent in the whole of the Arctic Ocean and temperature changes and, in particular, a more extensive ice cover was associated with the 1960s cooling. 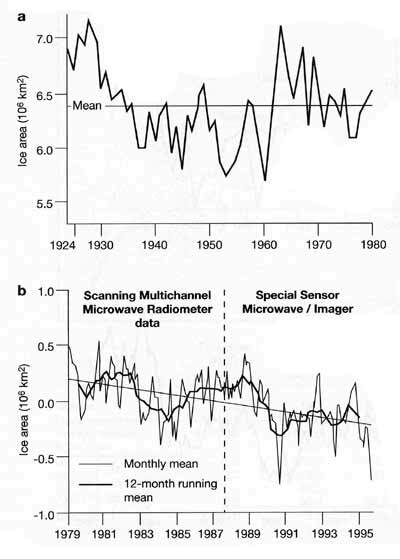 However, commenting on this correlation, Barry (1983) notes that historical ice cover data, obtained from ships and coastal stations, are of uncertain reliability because of limited coverage, especially in the earlier years. Airborne observations of ice cover were traditionally difficult because of the persistent cloud cover. This problem was overcome only in the 1970s when passive microwave satellite sensing became available. Several analyses based on passive microwave data, collected between 1978 and 1987, have suggested a small downward trend in the overall Arctic ice extent (Gloersen and Campbell, 1991; Gloersen, 1995; Johannessen et al., 1995). The most substantial reductions have occurred in summer ice cover in the Siberian sector of the Arctic (Parkinson, 1992; Chapman and Walsh, 1993; Maslanik et al, 1996). Thus summer ice extent in the Barents and Kara Seas between 1976 and 1990 was 6-10 per cent smaller than between 1961 and 1975 (Chapman and Walsh, 1993) and the springtime values of 1988-90 were the lowest between 1965 and 1990, which is consistent with the winter-spring warming projected by GCMs (Houghton et al, 1990). So far no significant reduction in winter ice extent has been observed. An unusual feature of the recent decline in the extent of Arctic ice is that there was no usual antiphase pattern between the Barents-Kara and Laptev-East Siberian sectors: the decrease occurred across the Russian Arctic. A possible explanation is a recent increase in depression activity in the Russian Arctic (Figure 8.5a) and reduction in sea level pressure over the central Arctic Ocean, and the combined effect of warm advection and offshore winds associated with the passage of depressions. Fig. 8.5 (a) Time series of cyclone occurrence north of Novaya Zemlya. After Maslanik et al. (1996). In addition, an increase in cyclonicity implies a stronger divergence in ice motion in a general sense and a subsequent reduction in old ice cover and increased formation of young ice. Analysis of a series of the mean 24-month vorticity index (Figure 8.5b) has shown that since 1990 vorticity over the central Arctic remained cyclonic for the first time since 1950, enhancing dynamic forcing of sea ice reduction (Maslanik et al, 1996; Walsh et al, 1996). While increased cyclonic activity in the north can be attributed to natural climatic variability, the GCM simulations also indicate that lower pressures over the central Arctic are a response to ice reduction. However, so far the hemispheric negative trends have been minor and do not suggest a major change in ice coverage. Alternatively, variations in circulation over the Arctic may be forced by anomalies in sea surface temperature which affect atmospheric circulation on a larger scale. Recently Gloersen (1995) has suggested that periodicities in sea ice cover variability are in agreement with ENSO events which are responsible for a large interannual variability in temperature and precipitation on a global scale. It should be noted that although reduction in sea ice extent was strongest in the Siberian sector of the Arctic over the last two decades, there were prominent interannual differences and years of decreased ice extent were interspersed with years of enhanced ice formation. Reliable observational records of sea ice extent, thickness, and duration of ice season are few, while interactions between climate and sea ice involve complex feedbacks and at present it is difficult to quantify the effects of climatic variability and predicted climatic warming on sea ice and as well as impacts of diminishing sea ice on climate.